I found the lecture topic on GM food very interesting because of the controversy it raises and the public discussions that arise from the issue. According to Gaskell et al. - “GM food and the misperception of risk perceptions” - the current public discourse on the concerns of GM food is dominated disproportionally by risks analysis; while the obvious benefits driving the advances for genetically engineered crops are often glossed over without much emphasis. I think that this is a particularly interesting viewpoint that strays and poses a different position from the common discussion of GM foods. While some genetically engineered crops may have detrimental effects to the crops, they intention behind GM foods is fueled by the benevolent purpose to increase production, higher crop quality and yield, pesticide resistance, and higher nutrition values. And with a deeper reflection on all agrotechnologies, shows that genetic engineering is not so different at all from other types of crop selection. The ethical concerns with GM foods, to me, arise from the politics of the agro-biotechnology. Patenting the process of genetically engineering crops, in combination with the global economy, raises ethical concerns at a worlwide level. The GM food phenomenon in the context of the global economy leads to the situation in which third world countries dependent heavily on crop exports become financially in debt to the developed countries with the patent. Moreover, GM food patent also dramaticalyl changes the cycle and agricultural practices - farmers cannot keep the seeds of the GM crops to use for the next cycle, but instead they have to purchase the seeds again to begin the next cycle of harvest. Also, the environmental effects of GM food is often unforeseable. Personally, my main concern is not necessarily with the issue of genetic engineering, but its politics and environmental effects on the global economy. 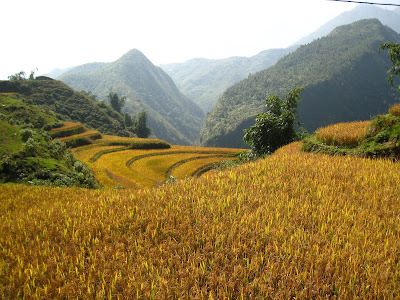 While I do think that GM food, like most technology, is driven by benevolent intention, the most critical aspects of GM food that need to be addressed are its impacts on the global economical inequalities and ecosystem. I feel that the disproportionate focus on the detrimental consequences of the science is detracting from these aspects that need the most attention. McDonald’s French fries clip from the beginning of the lecture makes me wonder what source of things and preservative do these manufactures are adding to the foods that they serve to the public. Does FDA research how this kind of food will be metabolizing in our body and is it really safe for us to consume these kinds of foods? Greenpeace Campaign : DNA- “Do you know what you eat?” : The DNA of genetically modified plants may contain the genes of insects, animals or even viruse. 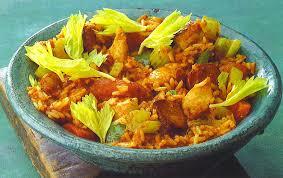 Every living things and organisms on this planet need to consume some sort of food for survival and refueling energy. Food is essential part of our daily lives and everyone eats at least three meals a day. The lecture was a big wakeup call me to really think about the food that goes into my body everyday and what this food will have impact on my body and health. What is GMO? GMO – genetically modified organisms have their genetic information alter to have some specific traits. GMO are basically man made and do not evolve and acquire these traits through evolutionary response. Therefore, GMO raises many ethical issues. How far human should be allow to create a whole new organisms from parts of many other organisms? A list of food that have been genetically modified and their unique properties can be found on http://en.wikipedia.org/wiki/Genetically_modified_food. One of the popular examples of advancement in GMO is the creation of the golden rice in the late 1990s. Insertion of bacterial and daffodil genes into the rice DNA will allow expression of precursor of Vitamin A, beta-carotene. While this creation of golden rice can save three billion people who are deficient in Vitamin A due to the regular rice, there can be many other unknown side effects. These GMO foods can be tested like many other food on the market, but it can have synergetic effects of different species genetic information which cannot be tested in the laboratory mice. Many scientists have also suggested that these synergetic effects can be low risk allergens to high risk carcinogens. The grapple is a relatively new fruit which is a genetic cross between an apple and a grape. The fruit combines the size of the apple with the texture of an grape and the flavor of both parent fruits. The grapple was originally designed to provide a much higher vitamin-c dose per fruit for third world aid. The majority of the funding for the fruit came from UNICEF. Last but not least, genetically modified crops can a treat to the biodiversity. As E.O Wilson described in The Future of Life, the bacterial toxin, used to protect corn from the pesticides, was carried by wind to the other agricultural field and killed many species that resided in that field. The tropic level of diversity was destroyed by affecting other organisms that are required for biodiversity. Therefore, these GMO can have not only primary effects, but also harmful secondary effects and we can never guess how severe these effects will be and how long will they remain. Many scientists have created GMO out of good intention to help out many third world countries with food supply, but we will never know what damaging effects they can have, and we will never know how many tests we need to run to make sure that they are safe. Therefore, we can educated people to use our judgments before they put these GMO food in their bodies. Genetic Engineering is something that should be given greater attention in today’s society, since it will affect us all in direct and unprecedented ways. It is a process that we cannot continue to ignore and put aside, because its consequences on our environment and on us, as individuals, can be staggering. After reading the article by Deborah B. Whitman titled Genetically Modified Foods: Harmful or Helpful? and watching the lecture by Mark Bittman: “What’s wrong with what we eat,” I realized how highly involved genetic engineering is in the world today and how uninformed the public is about many of its practices. The article by Deborah B. Whitman, titled Genetically Modified Foods: Harmful or Helpful?, was very educative on the advantages and disadvantages of genetically-modified foods. It brought to light many of the risks that GMOs (genetically-modified organisms) pose to the environment, to the economic stability of third world countries, and, most importantly, to humanity. This article also allowed the reader to weigh these potential risks against the potential benefits that can be produced through these genetically engineered foods. Some of the key benefits it shed light on consist of nutritional advantages, pharmaceutical advances, and phytoremediation procedures. The question that arises at this point is what risks are we willing to take in order to enjoy the potential benefits of Genetic Engineering? And are these risks worth taking or will they endanger the future of humanity? These are very important questions that should not be taken lightly and that we should bare in mind at all times. The benefits of genetically engineered products can be very appealing. The outcomes of this new technology can be of nutritional value in many underdeveloped and developing nations. 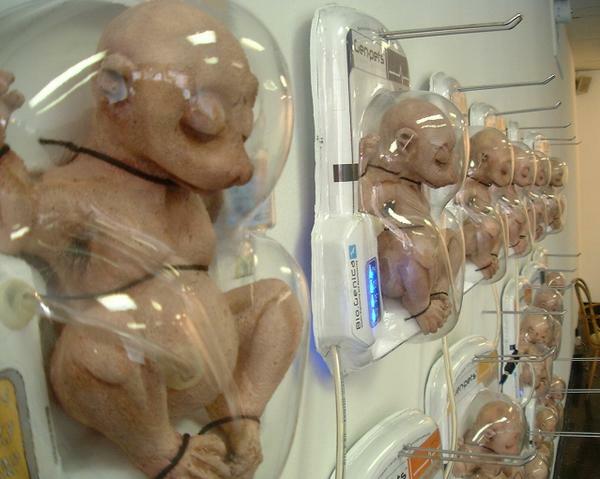 Genetic engineering can perhaps be the answer to the world’s poverty and malnutrition problems. Then again, it can also be a catastrophe resulting in poverty and malnutrition for the world’s population, if the manipulation of the natural process of life leads to its destruction. Moving a little bit away from the article by Whitman, I now want to focus on Mark Bittman’s lecture which is titled “What’s wrong with what we eat.” I believe the picture above illustrates in more than just words what Bittman strove to get across in his very intriguing lecture. I was personally intensely struck by the information Bittman provided on the negative affects of meat and junk food on our health. The negative affects of excessive meat consumption is something that I believe everyone knows at least subconsciously, but it was only after I listened to this lecture, that I truly felt like doing something about it. Perhaps it had such a profound impact on me due to the way he presented and categorized the information, calling it “a Holocaust of a different kind.” Maybe the reason why I felt so moved was due to the way in which we grouped animals and junk food as if they were both part of the same category. Whatever his technique was, it was very effective. Bittman demonstrated how overproduction and over-consumption of meat and junk food are leading to increased production of greenhouse gases and an increase in health related diseases in the western hemisphere. Bittman argued that in order to lessen these problems, it is necessary that animals stop being raised industrially and eaten thoughtlessly. This solution to the problem is one that will require wide governmental and industrial support which will be very difficult to attain. It also requires a change in the diets and ways of living that people are accustomed to. Although it will take lots of time and effort to achieve a healthier way of life, by taking the first step and getting educated, you have already gotten a lot closer to the goal. The class lecture and particularly the clip form the film “Super Size Me” fit perfectly with Bittman’s lecture. We truly are what we eat, and if what we are putting into our bodies is indecomposable or lacking of any nutritional value, we cannot expect to be healthy beings. The McDonalds fries from the film definitely had other chemicals and preservatives in them that would not allow them to decompose in weeks. In order for the body to receive the nutrients it needs to perform its bodily functions, it needs to be able to break down the food. The McDonalds incidence is one that should alarm us and enlighten the potential consequences of genetically engineering and manipulation of our foods. The use of chemicals that preserve food products for an extensive length of time, as well as those that have other genomic influences, can also have serious health affects. A predominant disease that can result from such chemicals and alterations in the food supply is obesity in children, as shown in the picture above, as well as in the adult population. Obesity is an increasing problem here in the United States as well as in other Western nations. The consequences of obesity are numerous and dreadful to its victims. The long list of diseases that result from obesity consists of coronary heart disease, type 2 diabetes, various cancers, hypertension , Dyslipidemia, stroke, Liver and Gallbladder disease, sleep apnea and respiratory problems, osteoarthritis, gynecological problems, and many others. It is vital that health concerns are taken into consideration when genetically engineering foods, so that the outcome of GMOs is safe and healthy for human consumption. I believe that in many ways art is nature. The beauty that we see in nature is what is used in art. Art is derived from nature’s diversity, whether it be the wide array of colors to the variety of organisms out there. The environment is in itself a form of art and it is something that art is derived from. It is sad how the human race is, in effect, destroying the beauty of nature. From a scientific standpoint we have evolved to live harmoniously with our environment. It is ironic that it is science that has contributed to the environmental destruction where genetically modification of crops have had dire consequences and the technology that has allowed the industrialization of farms has led to overconsumption and unnecessary overproduction. The way we have moved from living “naturally” to the industrial form of life of today, has resulted in grim consequences. We have damaged our environment and continue to do so. Our overt consumption of nutrition-less and unnatural foods has led to the downward spiral of overconsumption and destruction of our environment. Not to say that I don’t consume the processed products Mark Bittman was talking about, because I do, however I try as much as possible to consume as much natural foods as I can. After all, that is what nature has intended and in modifying our food source we are introducing unknown consequences. I moved to the U.S. when I was eight, and I was fascinated by the fact that there were strawberries in the fall and winter. Prior to that fruits had their associated seasons. There is something artistic to not seeing a peach or strawberry all the time. To having the opportunity to see it for a couple of months out of the year allowed you to enjoy that fruit so much more. The fruit also tasted so much better there than it does here in the U.S. It is most likely because the fruit and other foods were grown locally. Being a locavore has its advantages and in a way it is artistic because one gets to experience what nature offers and more importantly one can see the artistic and aesthetic side of nature: seeing fruits growing on trees the variety of vegetables out there, etc. In the paper by George Gessert, I found the discussion of animal domestication as art very interesting. If we think about it the dogs that we humans own as pets are not the dogs that existed a couple of hundred years ago. Dogs have been bred to look a certain way either big or small, long or short, with long straight hair or curly fluffy hair. The diversity of dogs we have is a result of human play with dog genes. We have over the years bred dogs to look a certain way such as the Labrador or the German Sheppard. I had not had a pleasure of attending lecture last week. So I am not really sure as to what I have to write for this week’s blog. But reading others, and the articles she sent us, I believe I have to voice my opinion about GMOs and using biotechnology for art. First of all, biotechnology for art. The article about Steven Kurtz was interesting. It is something that I have not been aware of. I guess using bacteria do carry risks of threatening the audience’s health and somehow encourages bioterrorism as Bush administration must have felt but I feel it is something new and fresh, it may mean more than just one painting or one movie, indeed a very strong communication. Isn’t that what art is? I l ike how in the end he says “If you are an artist, your job is not to be a part of the everyday and the usual. You’re supposed to go to the opposite end to find a new ways of thinking about culture and its images, to try to reframe issues in new and exciting ways.” Yes, some may stand against the norms of society but isn’t that how society progresses and advances? I feel we all can’t agree on something together. Everyone is unique and different. And among these differences our job is to find a way that suits and satisfies everyone. So I do like the idea how Steven Kurtz feels about his role as an artist. Inspired by his story, i have found another story about scientist/artist. http://www.dailygalaxy.com/my_weblog/2008/03/the-brilliantly.html His name is Joe Davis from MIT. These are some of his works mentioned in the article. 6. “recorded the vaginal contractions of ballerinas with the Boston Ballet and other women, then translated this impetus of human conception into text, music, phonetic speech and ultimately into radio signals, which were beamed from MIT’s Millstone radar to Epsilon Eridani, Tau Ceti, and two other nearby star systems. With GMOs I am pretty open about it I guess. From what I read from the article it seems like there is no strong basis as to why we should oppose GMOs. The article mentioned a couple animal testing on B.t. and Monarch Butterflies, genetically modified potatoes in rat’s gut. But there isn’t much to conclude that these will be same on humans. We have different physiology than them. We can’t conlude that what these stuides that are showing will have same effects on us. Maybe because I am a scientist. Without actually proving negative effects on humans, it doesn’t convince me why GMOs should be blinly opposed. Well, it may carry some enviromnetally negative factors. Then why don’t we find a solution using genetic engineering? eye for an eye. If we genetically modify the Monarch Butterflies to be resistant to B.t., then we can save them. The GMO resistance in Europe is strong than any other regions in the world. And there are coutries for example India favor GMOs. I think difference in culutre also plays a big role in opposition to GMOs. Europe with past history of mad cow and irish potatoe famine, they are being very careful about it. But their voice of opposition can’t be treated as a consensus. I did a google search on GMOs. And all I found was infinite number of opposition websites. I mean, I understand that it is food that we are talking about, but this debate has only been too one sided. And media does a good job on making it sound like it is the end of the world. With GMOs, I feel like we should give them a chance. But do the labeling. Let consumers have a choice. Let them be responsible for what they are buying. If they feel awkward about the idea and then they should avoid them. If they decide to try them out, you are responsible for the consequence. Just to see how it does. I don’t think it won’t have any problem when we know most of our foods have been genetically modified already whether you know it or not. And we had no problem with it. If people demand to know, let them know. However, I do feel that what they are proposing to modify should be strictly regulated and reviewed before the GMOs actually produced. Before the actual modification, their proposals should be reviewed throughly with supporting evidecnes. Also, identifying its social contexts. It is food after all, what we need and eat everyday. Its consquence may be unpredicatable but should it carry the risks, could be preventable in the beginning. For this week’s blog I would have to say that the lecture, readings, and viewing all tied in very nicely with one another. Each source covered a different aspect of genetically modified food and I think I received a better overall understanding of exactly what is going on. In the lecture, there was an issue that caught my attention, which dealt with a company selling crop seeds that are only good to grow for about 1 generation. Each year a new supply of crop would have to be purchased and replanted in order to keep farmers in business. The problems lie in the fact that farmers must first buy the seeds every year, plant them, invest in them with care, and then finally sell them at the end of the cycle. This is an unfair and unrealistic arrangement because farmers for decades have been planting and replanting the same crop from previous generations. I just think it’s unjust and impractical to make these 1 generation crops a standard among farmers. Another issue pertaining to this that I felt the need to mention, was the fact that these seeds may propagate with other nearby plants. Meaning that plants around the vicinity of these 1 cycle termination plants might be re-pollinated with this genetic modification and produce offspring that only survive for 1 generation. If this continues and becomes widespread we might actually have an epidemic on our hands. From the viewings, I found some of the information to be quite entertaining actually. For instance, the fact that 1/5 of all greenhouse gas is generated by livestock (methane production), is not only ridiculous but actually quite hilarious. I never knew that flatulents could do so much harm to the environment. It also makes me wonder, what about all the human flatulents? Do we contribute to this environmental damage? On a more serious note, that fact that there are more then 50% of all antibiotics administered in the U.S. is to livestock, blows my mind. That is a lot of medication and all to prevent infection of the food we will eat. I agree with Mark Britman on the fact that we do need to cut down on meat consumption and increase our natural-grown fruit/vegetable uptake. Britman mentioned that everyone used to be a Locovore (meaning they at food that was grown locally) and that since the economy changed, we as a society changed with it. We need to change our daily eating habits and go back to the way it was. Natural and Homegrown. I mean I could relate to this, though the monthly steak/ribs day can’t hurt, I do tend to eat quite a bit of salad and vegetables. Heck, I just feel sick without my daily dosage of lettuce and tomatoes. Once final topic I wanted to write about which was mentioned in the lecture, the viewings, and the readings was the DNA/Chromosome/ Genome in art. It’s interesting to see something that would never be thought of as art actually come out to be this original cool-looking piece of art work. The thing is that the genome represents all of the DNA in a living organism; and each organism has it own unique layout. In the into video by Barry Schuler, that I watched as well, he made it very clear that all organisms have their own genome; a grape or a human alike. I found it fascinating that gene manipulation like the GFP Bunny could really be considered art. I would think it’s just some cool demonstration of the biotechonolgical and scientific capabilities of some researchers. I never thought about all the artistic expression and thought that goes into producing that result. It is a pioneer field to explore and I hope new projects will be coming out soon here in Los Angeles so I can check them out for myself. There has been a host of questions and significant controversy over genetically modified “golden Rice.” This rice has enriched vitamin A content, and many are saying it could further be improved to contain vitamin E, iron and zinc. Proponents tout the rice as a cheap and affordable way to address vitamin A deficiency for people in Africa and Asia (for example), which could possibly save millions of lives. Opponents have varied arguments, ranging from the slippery slope of genetically modifying rice, to the unknown effects on the environment, to the corporatism associated with genetically modified foods. Below is a before-and-after picture of the modified rice. The other aspect of golden rice that is striking (besides its nutritional qualities) is its appearance and the aesthetics. The gold is brilliant next to the green, but still there is a distinct quality that is unnatural. The golden rice, in the same way that it seems artificial, also reminds me of the “gold standard” or the “Gold Rush”, which make me think of money and materialism. Many environmental groups thus may not be just protesting the specific rice, but what it represents in the form of corporate profits and the manipulation of nature of material gain. This symbolism seems to be inextricably connected with the golden field. Below is an illustration of the commercialization of the golden rice. I think golden rice can become a symbol for a movement towards better health in impoverished nations and reducing poverty, or it can become a symbol of corporate greed to irresponsibly change nature to bring in profits. Im still not sure which it will become. Hopefully some credible studies will clear up the debate on the rice’s effectiveness and ‘golden rice’ will stay true to its original intent. Rice of the future? The jury is still out. In my opinion some of the outrage over genetically modified organisms is overblown. It’s clear that we need to study effects of changes as much as possible, but empirically much of our food is genetically modified and we dont even notice it. Genetic modification doesn’t have to be drastic or transform some plant into a mutant- it can be slight changes that make food more cold resistant or disease resistant, a move that would reduce costs and allow less food to go to waste. Another argument is that we are “playing God” by tampering with nature. I dont buy this argument. One could argue that God has given us a brain to discover this knowledge and how to harness our environment, and this should not be wasted. If the ‘transforming nature’ argument held, we would not have buildings, vehicles, or other positive developments that may have interfered with ecosystems in the past. Still, we need to be careful, but i dont believe this means we should abstain from any modifications. Moreover, when people are malnourished (i.e. anemic or deficient in vitamin A) ethical concerns are trumped by concerns over basic needs. I was completely disgusted by the “Super Size Me” clips. I never saw the movie, but now that I have seen just a couple clips, I no longer want to eat at McDonalds and definitely not eat their French fries. What do they honestly put in their food? What do they put in their French fries that allow them to preserve for so long? I decided to look in to it. 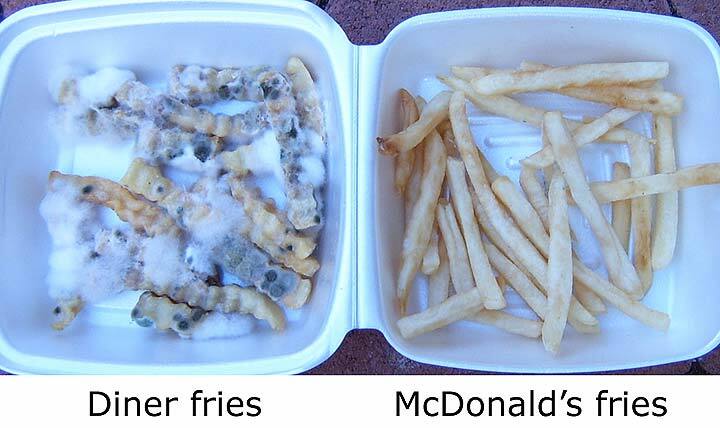 (Take-out diner French fries on the left and of course, no mold McDonald fries on the right) My question is where does the mold go? Is it there and we can just not see it? If it doesn’t deteriorate it in nature, then it cannot possibly deteriorate in our bodies. First of all, the list of ingredients is so long, which is not a good sign. Second of all, preservatives are included to help maintain the color of the fries and an antifoaming agent is added to also help preserve them as well. It is frightening and worrisome to think that the nation is consuming these chemicals. Could such chemicals have harmful long-term effects? If these chemicals can change food, then they can change our bodies. The saying goes, “You are what you eat.” Today, that is chemicals and pesticides. Last weeks lecture, made me think about my eating habits on a whole new level. The guilty pleasure of McDonald fries and a large Diet Coke during the week is no longer on my list. The lecture was enlightening, yet also disgusting. It made me think about what I am putting in my body on a much more conscious/subconscious level. Food has been so genetically modified to not only preserve it, but to also make it seem like it is healthier. For instance, the fad of DIET foods. What is in Diet Coke anyway? John McManamy believes that the ingredient added, Aspartame may be causing depression and bipolar disorders, which is further explained in his website: http://www.mcmanweb.com/diet_coke.html. Honestly, this is scary! Government warnings need to be put on these drinks similar to Cigarettes packages. Like cigarettes, at first nobody knew the all the harms and then years later, the deadly effects surfaced. Have we gotten out of hand how much our nation genetically modifies its food? Are the genetic modifications of food bringing about the rise of diseases, cancers, defects, brain tumors, etc. I did further research on what the different chemicals and modifications that can be made to food. According to , http://www.rense.com/general7/whyy.htm, “The federal Food and Drug Administration does not require companies to disclose the ingredients of their color or flavor additives so long as all the chemicals in them are considered by the agency to be GRAS (”generally recognized as safe”).” What does that even mean? This website also states that the same food coloring in makeup is also in food. With all these artificial colors and flavors, do we even know what is “natural?” Is orange juice even all natural? Learning all this makes me feel that we are being completely foolish and I believe that in years to come, we could see a serious epidemic surface. My interests in last weeks lecture and in this class greatly lie in trying to figure out what these chemicals really do to our bodies. What is going to happen in the next thirty years when we truly see the effects of all these chemicals and the harms it has on us and nature? I believe that the general public needs to be better educated on such a topic. On this note and research, no more soda, fake sweetners, fast-food, French fries…Im going organic! The Edunia has red veins on light pink petals and a gene of mine is expressed on every cell of its red veins, i.e., my gene produces a protein in the veins only. The gene was isolated and sequenced from my blood. The petal pink background, against which the red veins are seen, is evocative of my own pinkish white skin tone, due precisely to the blood in the skin. The result of this molecular manipulation is a bloom that creates the living image of human blood rushing through the veins of a flower. The fine work of art is being showcased on April 17 to June 21, 2009 in the Weissman Art Museum in Minneapolis. The hybrid plant is definitely a beautiful work of art, clearly showing the interbreeding between genetic engineering and art. Besides aesthetics, the fact that we have human DNA inside a plant, are we going to go even farther and make a hybrid between our DNA and other animals? I’m not opposing these hybrids as work of art, but it would be scary if that is what is going in my stomach, such as GM foods. Is it really safe? We think it’s safe but what about long-term effects? I don’t think we know too much about it. Is it really a Swiss army’s knife that can solve all of our current problems? In essence, you’re playing with a dangerous weapon inside a black box. You won’t know if it suddenly stabs you in the back. Can it really solve our problems? It seems like this is an ideal solution to solving the issue of world hunger and the massive humanitarian effort to save the third-world countries? However, would that really solve all our problems or would new ones arise because of that? If we were to have to GM foods, there must be a regulation, an ethical oversight to ensure that the food is safe. By the meaning of safe, I do mean long-term and short-term effects. Having said all of this, is it too late? According to the International Food Information Council (IFIC), only 40% of Americans know that they’re actually eating GM foods. In fact, the U.S. government does not label GM foods. According to the FDA, GM foods are equivalent to unmodified “natural” foods. In 1989, genetically engineered L-tryptophan (a common dietary supplement) killled 37 Americans and permanently disabled or afflicted more than 5,000 others with EMS, a fatal blood disorder, before being recalled by the FDA. In 1994, the FDA approved the sale of Monsanto’s controversial genetically recombination Bovine Growth Hormone (rBGH), injected in dairy cows to force them to produce more milk. This has been proven to elevate IGF-1 could pose serious hazards for different types of cancer, including human prostate, breast, and colon cancer. The U.S. is the only country to have banned this? In 1999, it was shown that genetically engineered potatoes, spliced with DNA from snowdrop plant and a viral promoter, the Cauliflower Mosaic Virus (CaMv) are poisonous to mammals. Genetically engineerd-snowdrop potatoes, found to be significantly different in chemical composition from regular potatoes, damaged the vital organs and immune system of lab rats that were fed the potatoes. UCLA HNRS 177 - Biotechnology and Art - Bioartists use cells, DNA molecules, proteins, and living tissues to bring to life ethical, social, and aesthetic issues of sciences. This course will study how bioart blurs distinctions between science and art through the combination of artistic and scientific processes, creating wide public debate. We wil explore the history of biotechnology as well as social implications of this science.